We’re celebrating your PTA/PTSA accomplishments this year in a new way. 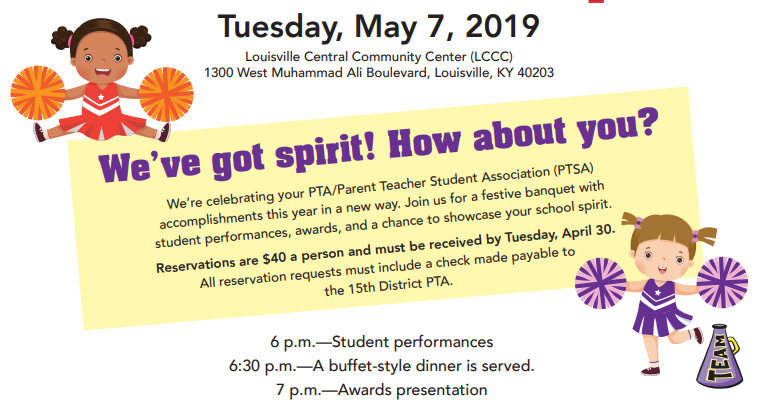 Join us May 7, 2019 for our annual awards banquet. Join us for a festive banquet with student performances, awards, and a chance to showcase your school spirit. Reservations are $40 a person and must be received by Tuesday, April 30. All reservation requests must include a check made payable to 15th District PTA. Guests are encouraged to wear school colors and spirit wear and will receive a celebratory pom-pom upon arrival. For more information, call (502) 485-7450.